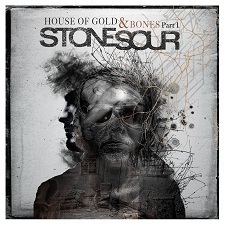 The House of Gold and Bones - Part 1 is the first installment of Stone Sour's new double concept album. It is the band's first album without bassist Shawn Economaki. Rachel Bolan of Skid Row fame temporarily joined the band to record both parts of The House of Gold and Bones. Part 1's opener "Gone Sovereign" begins with feedback noise and heavy repetitive guitar riffs. Corey Taylor's vocals are calm, yet powerful, in the beginning. They periodically get louder, and come to a scream during the highly intense "This is MINE" line of the song. The guitar solo is purely hard rock--with fast, screaming notes. It is definitely something that fans of more classic hard rock and heavy metal will really appreciate. "Gone Sovereign" bleeds into the following track, "Absolute Zero". During this transition, the word "yeah" is sung in a dark, dissonant type vocal. It almost sounds like something out of an Alice in Chains song. The "yeah" (or "hey" as it often sounds) is prominently featured throughout the song. "Absolute Zero" has some moments of screams, but the vocals are mostly a melodic style. This song, with its heavy and driving beat, also features a catchy chorus with the memorable lyric, "You're looking at an absolute zero / I'm not the devil / But I won't be your hero". Part of what makes The House of Gold and Bones - Part 1 a concept album of sorts are the recurring themes and motifs. This really begins to take shape with "The Travelers Pt. 1". This track is a peaceful ballad featuring an acoustic guitar with an underlying string arrangement. It is highly emotional, and very descriptive of travelling through life. The vocals are super pure and clean, but the song ends with muffled screaming in the background, which escalates into the next track, "Tired". "Tired" is much heavier than previous track, but it's definitely not the heaviest song on the album by any means. It opens with a somewhat bluesy guitar riff, and an orchestral string arrangement soon appears again. The strings really add more fullness to this track. I'm very drawn to the overall big sound and the intense outpour of emotion. "Taciturn" is another acoustic ballad on The House of Gold and Bones - Part 1. It too is highly emotional, which really comes across in Taylor's vocals. "Taciturn" is more dynamic than the previous ballad. It has a lot of build-up and suspense. It briefly "goes electric" toward the end, but it ends in the acoustic style in which it started. "The Travelers Pt. 2", which is near the end of the album, revisits "The Travelers Pt. 1". It is quite a bit heavier than Part 1, especially at the beginning where it prominently features heavy guitar riffs. The vocals also often have an interesting muffled quality to them. "The Travelers Pt. 2" recalls some of the lyrics from Part 1, particularly the "I don't need a conscience..." line. This gives the song a strikingly similar chorus. The dark guitar riffs from James Root and Josh Rand really add to the mood. A heavy bass line leads into the album's final track--the highly energetic and aggressive song "Last of the Real." Stone Sour's The House of Gold and Bones - Part 1 boasts a great balance of introspective ballads and heavy rock songs. It is an incredible musical journey through pure aggression and sincere emotional contemplation. The tracks are well organized, and the constant changes in pace always keep it exciting. I absolutely cannot wait to hear the continuation of this album! The House of Gold and Bones - Part 2--which was recorded alongside Part 1--will be released in 2013.